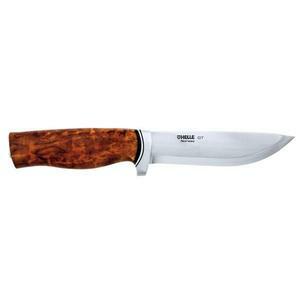 The Helle GT is my second Helle knife I have the Harding as well. The fit and finish of the knife is typically Helle in that because a lot of the processes in making the knife are still done by craftsmans hands there are slight imperfections cosmetically if you look closely. For my part they Enhance the knife above and beyond any computer robot offering from a lot of other knife makers and Im talking of some top names here. My curly birch handle is stunning and Im confident will get many years of use from it.Trouble is I would still like some more Helle Knives!